September 2016 Horoscope for Taurus zodiac sign shows that the planetary strength is located in the Southern sector of the horoscope towards the Nadir sign. Career and professional matters will be in the back ground this month. You can concentrate on domestic concerns and on enhancing your inner strength. Psychological stability will help you to tackle business problems more effectively. Majority of the planets are situated in the Western half of the chart towards your ascendant sign for the Taureans. Independence and assertion will have to be replaced by conciliation and cooperation. Good relations with people will yield results and interests of other people will dominate over personal ambitions. Flexibility to the surroundings will be required in September 2016 to accomplish your objectives. Taurus, there will be drastic changes in your friendships as well as with elder members of the family. There will be significant alterations in the lives of children and Taurus personalities who have creative inclinations. Professionally September 2016 is an excellent month for the employed Bulls. Job seekers will get many openings and will be able to get jobs they enjoy. Businesses will prosper with new clients and expansion. The September 2016 Taurus astrology predictions show the influence of planet Mercury in your monetary situation. Many avenues of earning money will open up this month. Career and risky investments can give good cash flows. Family members are supportive and will provide you with opportunities financially. Investments for the Taurus zodiac sign in health care and fashion industries may become productive. Your financial acumen will be sound due to the beneficial planetary positions. Taurus 2016 love forecasts for September 2016 predict that existing love partnerships will become stronger. Married life will be harmonious with good relationship with your spouse. This is a good time to plan for a baby. Planetary strength will be more after the 22nd for love affairs. Single Taureans will make relationships for fun and enjoyment. You will find your soul mate at the workplace, fitness centres or may be your girl friend. 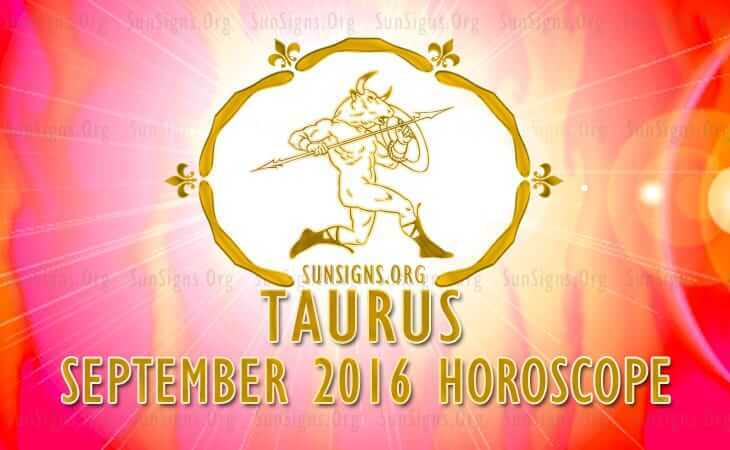 In September 2016, Taurus people will be very much interested in maintaining their health. Taurus fitness will be magnificent and you are regular about your exercise and diet plans. You may make beneficial changes to these routines. You are investing more time in health related subjects to improve your knowledge. Knowing the health benefits of what you eat everyday can prove to be useful. To conclude, the Taurus 2016 September horoscope predicts that you will become health conscious and work harder in maintaining your relationships.